The study of geometric properties and spatial relations unaffected by the continuous change of shape or size of figures. 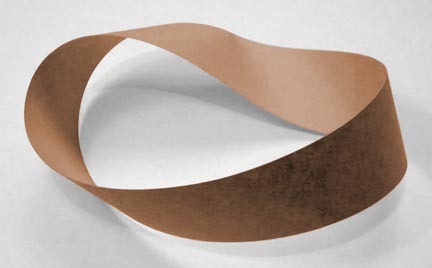 A Möbius strip is a curvilinear form made from a flat, flexible strip that is twisted 180° and joined at the ends. This effectively makes only one surface rather than a top and bottom. It also contains a single infinite path. An ant traveling along the length of this surface could walk forever. Although a Möbius strip is considered a single surface once assembled, it is no longer planar because it doesn’t contain flat surfaces. 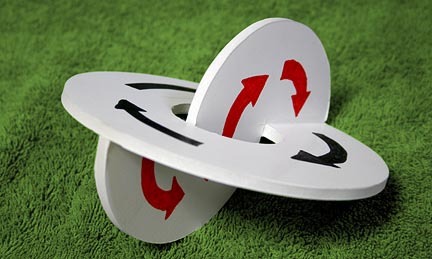 “Two Disks”, Perplexus in its simplest form. Perplexus is analogous to a planar version of the Möbius strip in that it is composed of a single path traversing its entire surface. Like the Möbius strip, it can be designed to run infinitely, curiously resembling the symbol for infinity: ∞. Although Perplexus is fundamentally composed of a single path and can be made into an infinite loop, it still may not be considered a single surface because it is composed of the intersection of multiple planes. The models shown above and below only came to me while working on my first Giant Superplexus in 2007. What should this form be called, and is it topologically like a Möbius strip? Tell me. This one is similar to the “Two Disks” version in functionality, but with a penetration. Are they topologically the same? I'm not sure. If you know, tell me. 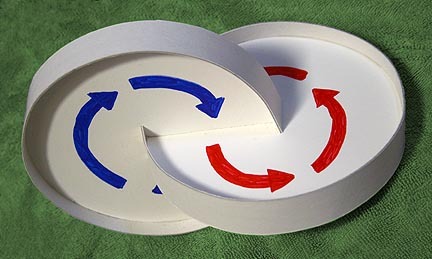 On the front and back of both disks in “Two Disks”, the path flows in opposite directions. On the front and back of the ring element in “Penetrated Disk”, the path flows in the same direction, while only the “S” piece flows in opposite directions!